We packed the car and stopped at a pharmacy for a few items before leaving Durango. John said he couldn’t have planned it if he tried, but the train was just leaving the station. 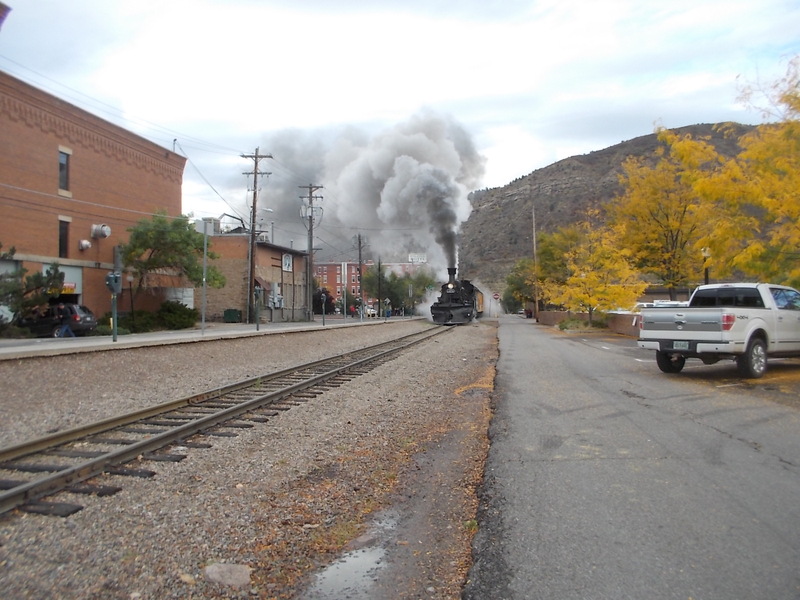 We hopped across the tracks where I took six shots of the engine. John agreed that I could delete one. 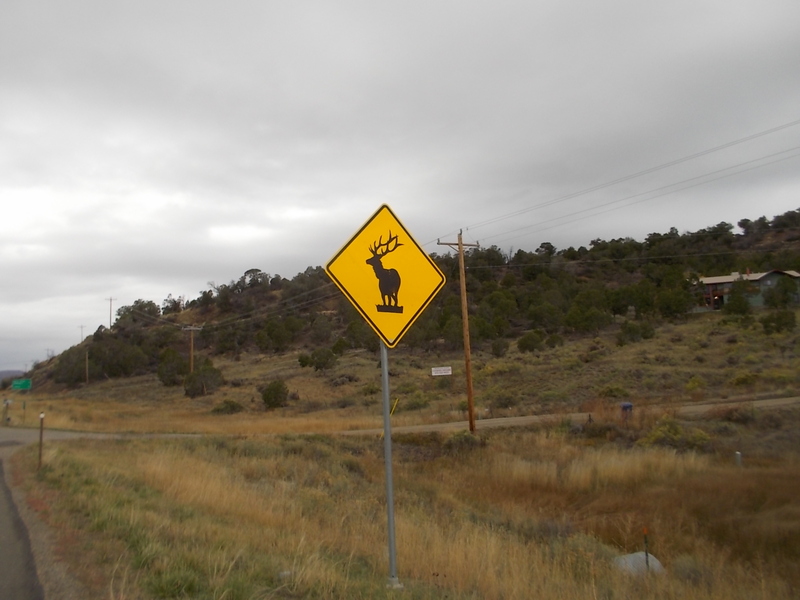 The most amusing road sign out of Durango was one for elk crossing. I missed it the day before, and when we passed it going fast, John offered to make a U-turn so I could take a photo. Wasn’t that kind? I said I could live without it, but I’m very happy to have it. We stopped at Four Corners where we could have our feet in four states at once – Utah, Colorado, New Mexico, and Arizona. I call that last state Arid Zone, because my lips and hands felt as dry as could be. I took a picture of my feet in Utah, because niece Chrissie was in that state for a meeting. Williams AZ was our stopping point. Does anyone recognize Williams as a center for trains? I didn’t. I thought we were going to the Grand Canyon. We were, but John needed an evening of train watching. This suited me fine, since I would have time to write while he was out. When we lived in Phoenix, my husband, Bill, was a civil engineer working on I-40 (which he says goes right by Williams). Hope you are having a grand time and I know you will be thrilled at the Grand Canyon. We love the scenery in the West and have enjoyed seeing friends of long standing. When I was in Wisconsin Miss Madison let me turn around to get a snowmobile crossing picture so I’m completely feel ya on wanting an elk picture! I have never seen a snowmobile crossing sign. That is great. Anne’s feet in Utah totally made my day! How awesome was that!?!? !